It is our lot, those of us who care about conserving Portland's treasures, to play defense. The Shemanski Fountain, built in 1926, a gift from Joseph Shemanski, a Polish immigrant, to the city that showed him kindness. 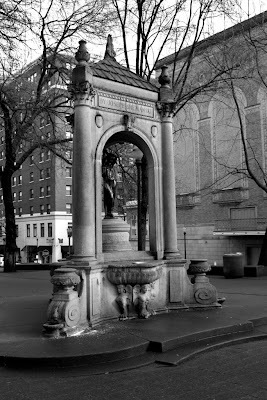 On the night of April 25 2007 vandals attempted to steal the statue, Rebecca at the Well, within the Shemanski Fountain in the Park Blocks. The statue's base held, but the fountain was heavily damaged. Months of restoration work followed. Since being repaired the fountain was damaged again, this time by metal thieves looking to cash in from selling its fixtures. Today it bears the marks of recent tagging. The incidents highlight the disturbing vulnerability of our public heritage resources to those tone-deaf to anything but their own impulses. Possible solutions, barriers or relocation are unacceptable; to protect Portland's communal historic places from vandals and thieves can present challenges to their very nature as shared space. To protect them from Portland's government might be harder still. 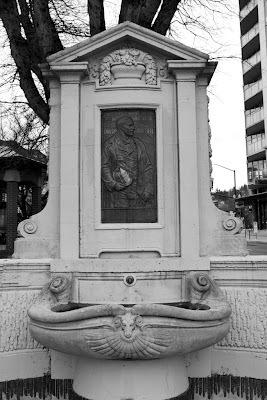 At the intersection of SW 18th and Burnside in Portland Firefighter's Park is another fountain, the David Campbell Memorial, which faces threats even more immediate and dire than those pitted against the Shemanski Fountain. 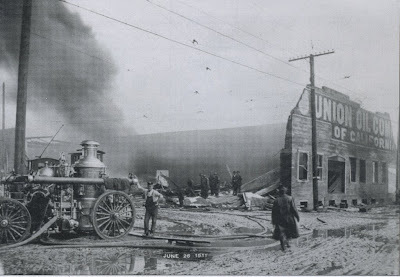 The Union Oil fire, June 26 1911. -From Portland Fire and Rescue by Brian K. Johnson and Don Porth, Arcadia Publishing. 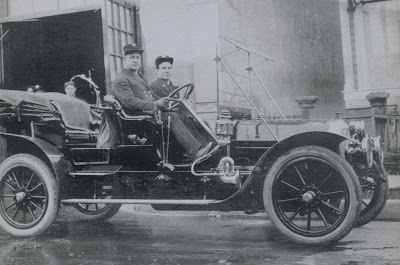 On June 26, 1911, Portland's Fire Chief, David Campbell was directing the response to a massive fire at the Union Oil Company on the southeast corner of Water and Salmon in south east Portland. The fire, fed by abundant fuel, was so large that it attracted crowds to the area estimated by the Oregonian at ten thousand. As the structure weakened, retreat was called. David Campbell entered the building to make sure there were no longer firefighters within. A huge explosion brought the wall down that killed him. The corner of SE Water and Salmon, January 2010, home of Pratt and Larson's tiles seconds room. The building was constructed nine years after the Union Oil fire. Portland's fire chief for eighteen years, David Campbell was a beloved local figure whose firefighting career spanned back to the days of the volunteer fire department prior to 1883. As chief, he was an innovator who introduced motorized vehicles and fire boats to the department. His funeral procession, witnessed by 150,000 people, was likely the city's largest outpouring of public grief. "I loved Chief Campbell and I want everyone to know how good he was. He always had a smile and a kind word for all the school children. Whenever we were late he used to take us up to school in his auto just a-whizzing, and at noon we used to hurry back from lunch and he would let us ride with him. I think he was the best fire chief that ever lived. I want to be good to the children when I get big, like he was." -Maurice Johnson, ten years old from the Rose City Park neighborhood, in the Oregonian, June 27 1911 (from a hand written note that he delivered to the Oregonian office). Portland Fire Chief David Campbell. -From Portland Fire and Rescue by Brian K. Johnson and Don Porth, Arcadia Publishing. The David Campbell Memorial and Medal Fund was established on June 21 1913 to commemorate David Campbell and all Portland Firefighters who lost their lives in the line of duty to follow. Land at 18th and Burnside was donated to the city by Katherine A. Daley in 1918. The memorial was designed by architect Paul Cret of Philadelphia, whose career would include the Folger Shakespeare Library in Washington DC, the Main Building of the University of Texas at Austin and the Cincinnati Union Terminal. 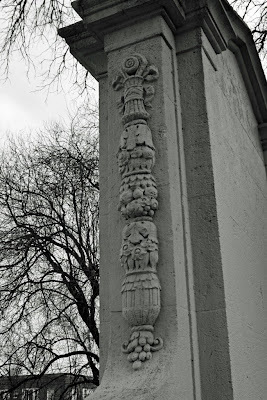 Constructed from Caen limestone imported from France, it was dedicated by Mayor George Baker on June 27 1928. 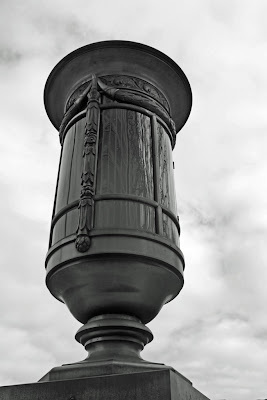 The grounds bordering the memorial were expanded to create Portland Firefighter's Park in 1964, which includes a list of thirty two Portland firefighters that lost their lives in the line of duty and an alarm bell dating from the year after the great Portland fire of 1873. 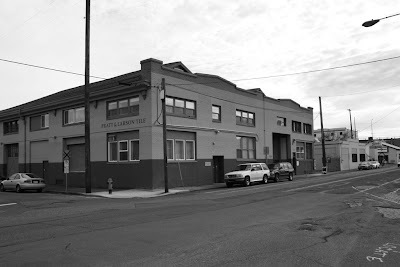 A proposal for a new fire fighters memorial to be built near the east side of the Hawthorne Bridge has been announced, supported by Commissioner Randy Leonard. Three finalists are being considered with hopes of a dedication on June 26 2011, the hundred year anniversary of David Campbell's death. The goal of the David Campbell Memorial Association is to provide a larger more accessible memorial to Portland's fallen firefighters. It would be hard to harbor reservations against the well intentioned project were it not for the fact that it entails the destruction of the original memorial. Plans include the removal of the bronze plaque and at least one lantern to incorporate them into the new structure. To cannibalize a historic civic space to build a new memorial shows an almost inconceivable degree of disregard for Portland's shared heritage. "It's a memorial, unfortunately that time will disintegrate." Which is true - in so much as the same thing could be said about nearly everything. "Sadly, the 81 year old memorial is crumbling and beyond repair, experts predict that it will not withstand many more winters." Which stretches the definition of beyond repair well past the breaking point. Despite a very limited public process, word of the plan to demolish the original memorial is spreading and efforts to preserve it are starting to coalesce. A facebook page, a petition, testimony at city hall and numerous articles seek a larger airing of the issue. The question is not if Portland's firefighters deserve a larger, more accessible memorial. They most certainly do. But does it have to come at the cost of the first one, with its own intrinsic value in addition to what it represents? Is Portland large enough for two memorials or so small as there can only be one? 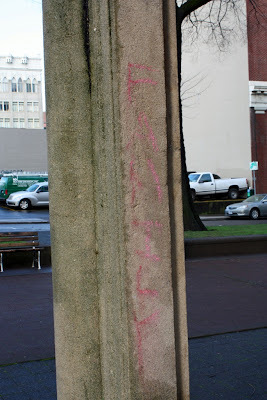 It is hard to imagine that the David Campbell Memorial with be defaced or demolished by the city of Portland. It should be regarded as sacrosanct -because it is. 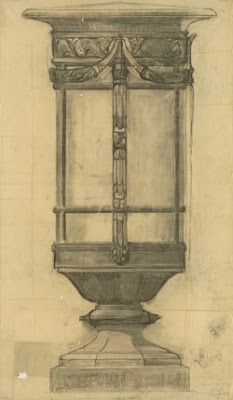 A middle course, the transfer of the bell and plaques outside of the original memorial, is easy to envision, as is the possibility more thoughtful heads prevailing. 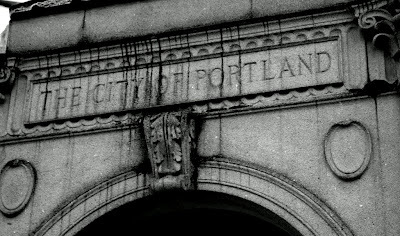 If not, it will be time for those who care about Portland's shared, historic resources to rally and walk the talk. It is, after all, our lot to play defense. In the meanwhile, check out the links below, visit the memorial and assess for yourself the dire claims of its condition. More important, appreciate it for what it is; it might not be there long, and for what it means. Please join the facebook page. You tube Video of Paul Crett's work. The Ellen Phillips Samuel Memorial, also designed by Paul Crett, restoration. 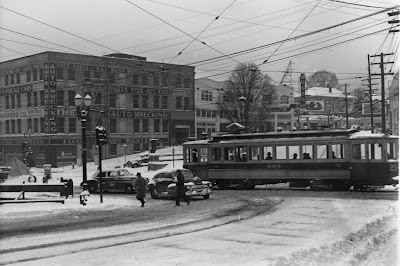 18th and Burnside, circa 1949. 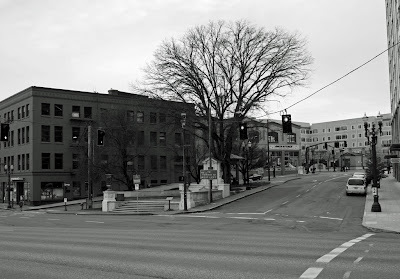 18th and Burnside, January 2010. -Thanks to Jon Gustafson for sounding the alarm and Tanya Lyn March for keeping it ringing. Dan, thanks for helping publicize this danger to a fine monument. The Campbell Memorial is not detriorating any more than any other structure of its age. I will write to the city commissioners including Randy Leonard to urge them to keep the fountain intact. I agree the bell, in a separate, 20-year old (?) structure, could be moved, but the fountain, and all it's plaques and light fixtures, must stay! Writing to City Council or emailing them is most important to save this monument. Council members have only heard from a few people. 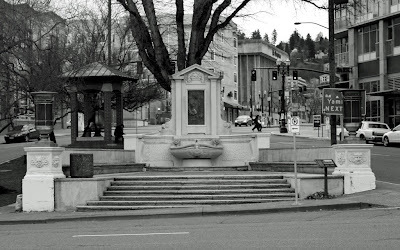 Let them know how important this fine sculptural fountain is to West Burnside and the city. Burnside at 19th, Portland Oregon 1939. So I was hunting for the Murnane Memorial today could find anything. So I went looking online to see if the outcome had been utter loss. Now according to Wikipedia Francis J. Murnane (1914-1968) a longshore worker was a active historic preservationist. We need to learn more... "Campbell Memorial, which stands at 18th and West Burnside in Portland and honors Oregon firefighters killed in the line of duty. Murnane testified at a City Council meeting that 'Should placing new stones at the memorial be required, whatever the cost, civil decency and respect for those who gave their lives for their fellow citizens – are ample justification.'"